“THERE’S NO JAM!” yelled Sam. “This doughnut is wrinkly! This doughnut is jamless and dry! Who are the culprits? Sam sets a trap to catch the jam thieves and gets a surprise! It’s the JAMPIRES: friendly little creatures whose love of jam and sweet things gets them into trouble! They fly off with Sam to their magical land sitting in the clouds, where doughnuts grow on trees, jam tarts sprout like flowers, and castles are made of jammy sponge cake. 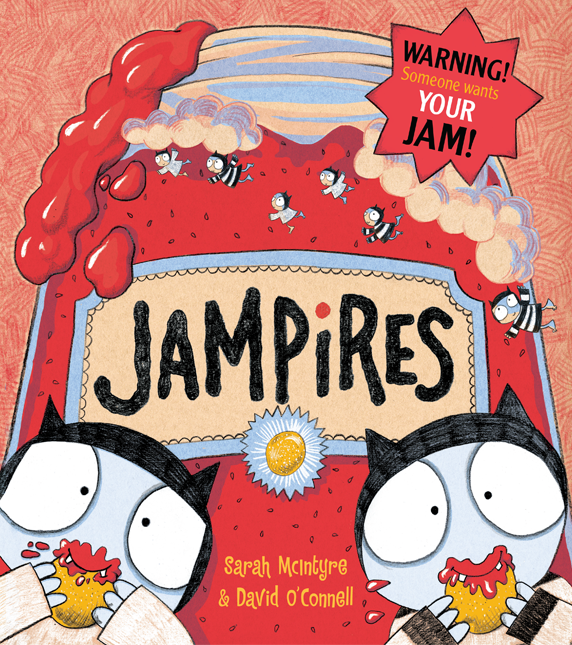 It’s a delightful, slurpalicious, JAM-tastic adventure, brought to you in this magical picture book by co-authors and co-illustrators Sarah McIntyre and David O’Connell. Jam loving kids will enjoy this! JAMPIRES is available in hardback and paperback formats. Please support your local bookshop if you have one! You can find your nearest bookshop using this link. Alternatively you can use Hive to order a book online and have it delivered to a shop near you.